On June 3, just before giving a speech in St. Paul, Minn., to celebrate his final victories over rival Democrat Hillary Rodham Clinton, Obama exchanged this common gesture with his wife Michelle. 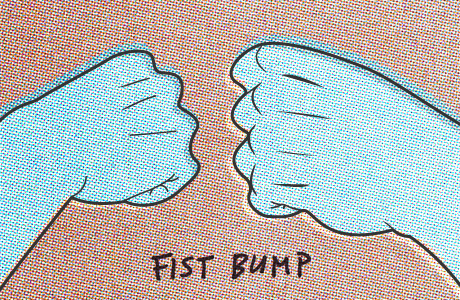 Although it has been used for years, particularly in the sports world, some Americans seemed confused about the fist bump, and its name became the focus of some debate. Aficionados simply called it the "pound," but a Fox News anchor named E.D. Hill famously suggested it might be called a "terrorist fist jab." (A few days later, Fox announced that Hill's show was being cancelled, although she stayed at the network.) Michelle Obama later went on ABC's The View and jokingly fist-bumped all its hosts. "I got this from the young staff," she said. "That's the new high five."